In my memory, Grace Jones never played on the mainstream radio stations in Jacksonville, Florida in the 70s-80s - not when I listened. I get the impression after reading I'll Never Write My Memoirs that this wouldn't have bothered Grace. Her albums and songs have charted in the US, and with greater success in other countries, but like with many acts it took the launch of MTV to introduce me to this slender cat woman in gray, creeping up a staircase in impossible heels and barking out "Demolition Man" like she ordered you to listen. Grace Jones was and remains badass. When I saw this book you bet I put on the brakes and got a copy. Anybody who survived Studio 54, industry discrimination, and Dolph *drool* Lundgren has a hell of a story to tell, and while going in with my own perception of Grace the entertainer I came away with a higher respect for Grace the person. This book, presented in the "as told to" format through rock journalist Paul Morley, ebbs and flows through her life in a colorful narrative, and unlike previous memoirs I've read where one senses a reluctance to confess, Grace lays it all out. One will hear legends of Studio 54 where Grace walked around naked - this book has that feel. There's no shame in revealing moments of shyness, anger (justifiable at that, particularly when people try to screw you come payday), and frustration (we can't hire you because XYZ). Grace makes no bones about her influence in music, either - I'm still trying to figure out the mysterious "Doris" she speaks of, an entertainer wanting to emulate and collaborate. I have it narrowed to two possible suspects. If you are stickler for timelines, know that Grace warns early on how she doesn't keep track of time. 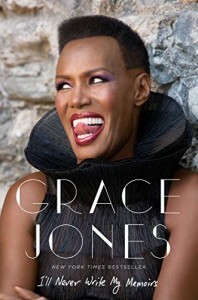 Not good if you're The Doctor, but one expects a person like Grace Jones to remain timeless. Her story may hop around but not enough to distract. It's a fun ride with bittersweet memories of people from an era long gone and a strong message: you deserve compensation for your talents.